Before Kanye slapped an iPhone shot of the Tetons on his new album, but after we ruined Niagara Falls, in part prompting the creation of an entire system of protected federal land, I spent a winter in Jackson, Wyoming working under what I can safely say is the best job title I’ll ever have: sleigh ride naturalist. My job was to hop aboard a sleigh driven by a burly cowboy and guide tourists huddled under thick wool blankets out to see a herd of elk, tell them the story of the National Elk Refuge, teach them about the wildlife, and make sure they didn’t get frostbite. Truthfully, I took the job so I could be close to Jackson Hole Ski Area’s 4,139 vertical feet and continue living the ski bum dreams of my dirtbag 20s. And while I did indeed do that, it was the elk and their lives on an increasingly fragmented landscape that ultimately shaped me most. The Greater Yellowstone Ecosystem used to be home to hundreds of thousands of elk. Today, 40,000 of the majestic ungulates still call it home, and signs of them are everywhere if you know what you’re looking at. Their marks can be seen in the forest, on well worn trees they use to rub the velvet off their antlers each spring. Their bugles can be heard during the mating season known as the rut, a natural clarion call that wouldn’t be out of place in Carnegie Hall. And when the first snows fall, they begin their move from the highlands and forests down to the valleys where they overwinter. Each elk herd follows the same migration paths the countless generations before have. Up to 7,000 find their way to the National Elk Refuge that abuts Jackson, Wyoming. And each winter, thousands of tourists flock to the area to see the elk, purchasing a ticket at the local visitor center, then hopping aboard a school bus that whisks them off to where they hop on a sleigh a couple miles north on the two-lane highway that takes you to Grand Teton and Yellowstone. The road mirrors the western flank of the refuge’s nearly 25,000 acres, demarcated by a tall fence interrupted by the occasional break where a berm allows elk to hurtle onto refuge land. The steep wall of dirt on the other side also means they can’t climb back out and onto the road. Dubbed elk jumps, they’re a microcosm of all the ways we’ve tried to allow eons of elk instinct to continue existing amidst a few centuries of human development. The refuge was set aside in 1912 to protect elk from this increasing encroachment. 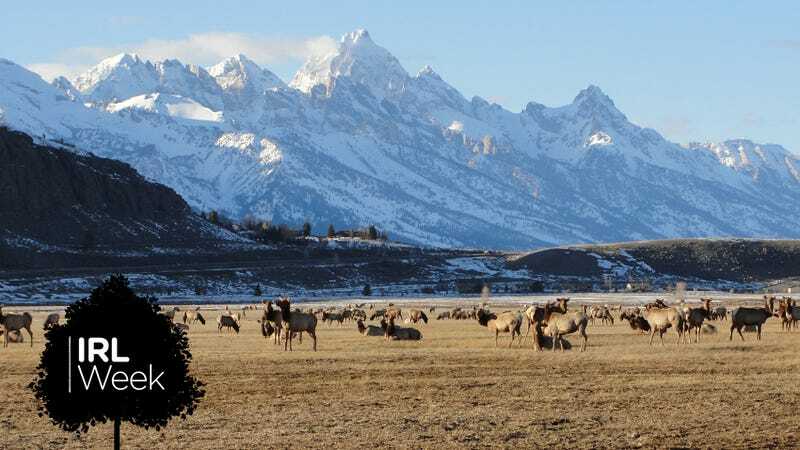 As humans moved into Jackson Hole—the valley between the Tetons and the Gros Ventre Mountains that acts a funnel for water from both ranges—with their livestock, they came into ever increasing competition with elk for food and land. By 1910, the elk herd was near starvation and the townsfolk in burgeoning Jackson sprang to action. They got the Wyoming legislature to appropriate $6,000 to buy hay to feed the herd. The next year, the federal government ponied up $20,000 to feed to the herd again and figure out what was going on. In 1912, the refuge was set aside by the federal government. The winter feed line has continued since then nearly uninterrupted. Sleigh rides were first officially offered to the public in 1965 as a way to visit the elk, a thread of its unnatural history I picked up in 2006. That winter, the snow barely fell meaning most sleigh rides ended up being on wheels as opposed to runners, each bump in the rough prairie magnified by our suspension-less chariot tugged by two draft horses. We knew where the elk were each morning because we knew where refuge staff had dropped pelletized alfalfa. But along the way, each trip was unique. Sometimes we’d find a pair of bald eagles in a tree, other times there were coyotes mulling about. On one occasion, wolves had a made kill in the pre-dawn and were feasting on a carcass, visible through binoculars on the first ride of the day. But the highlight was always the elk. Their forms would emerge on the horizon, antlers sticking up like angular tangles of shrubbery. In an instant, it feels like you’re in the middle of a herd, surrounded by thousands of wild animals that in any other situation would flee for the hills. But winter is a time of rest for them, all their energy devoted eating enough food to survive and stay warm. I’d always stop talking when we were in the middle of the elk, save to point out a really large bull or the one elk that had an antler genetic deformation that caused two lobes to form on the bottom of its antlers like tear drops. Sitting there, it’s easy to get lost in the collective breathing of the herd. The altered landscape, one that we’d inserted ourselves into, still holds a natural rhythm even if just for a few minutes. Nothing can prepare you for the experience of seeing these animals. Even though it’s been 12 years since I set foot on the refuge, my time there still guides me. It crystalized how we’ve already tweaked the natural world in strange ways and how it continues to shift. I’d recommend you find your own moment of contemplation while visiting the elk, or the many other wildlife that live on the 640 million acres of public land in the U.S.